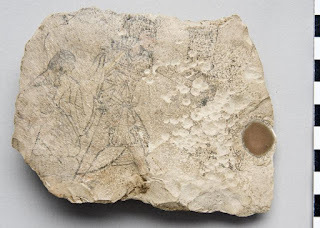 Ostracon, evenly rectangular. On one side small flint inclusion, on this side a sketch in red and black. It shows a king and a servant. The king is in the middle of the sketch, outlined in black and with the face coloured red. He is wearing a short wig and a uraeus and headband. He is wearing a shirt which is covering the upper part of his upper body and which is tied around his waist. It has short sleeves and looks spotted, possibly a leopard skin? The king is also wearing a short kilt, decorated with sun discs and uraeus. He is wearing bracelets. Above the left arm are traces of an inscription. The second man is also facing right. He is dressed in a wide, pleated garment and a black wig. He is carrying over his shoulder a bow and a sword or an axe. He is shorter than the king.